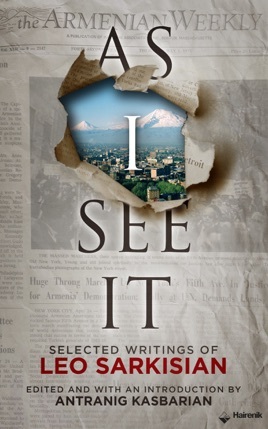 As I See It is a collection of essays on Armenian-American culture, politics, and current affairs by the late Leo Sarkisian (1934-1992), a prolific writer, commentator and activist who served for many years as regional chairman of the Armenian National Committee. During five decades of political activism, Sarkisian became widely regarded as a leader in the effort to promote and modernize the Armenian Cause. Working on behalf of the Armenian National Committee, Sarkisian was instrumental in politicizing the Armenian Genocide issue and worked in numerous forums- the United Nations, the United States Congress, the media, public schools, and grassroots coalitions - to present the story of dispossessed people as an international question of contemporary relevance. The book is arranged into six sections, entitled "Early Writings," "Armenian-American Community Life," "The Armenian Self-Image," "The Armenian Genocide," "International Politics," and "Armenian-American Culture." The essays contained therein were written between 1951 and 1992, during Sarkisian's several stints as a columnist for The Armenian Weekly.